That's what I've been up to the past couple of days - making quick and simple cards!! I had some stamped Bella Images sitting here that people have sent me (since there actually ARE some Bellas that I DON'T own *gasp*!!) and thought it was high time I used them!! I also decided that it's time to start using up some of my Rob & Bob patterned paper. I got a huge slab of it at Michaels some time ago and need to use it up! The yellow pattern is so light and springy so of course I had to use it. This bella image is Grumpablla and I just used SU! markers to color her in. The sentiment is from Papertrey - the new Faux Ribbon set. STAMPS: Grumpabella from Stamping Bella, sentiment from Papertrey's Faux Ribbon set. CS: Whisper White, Pretty in Pink, Lavender Lace, Certainly Celery, Rob & Bob Patterned Paper. INK: Black, Pretty in Pink, Regal Rose, Certainly Celery, Blush Blossom, Close to Cocoa, Whisper White Craft. ACCESSORIES: White Gel Pen, Ribbon, Small and Large Oval Punches (SU! 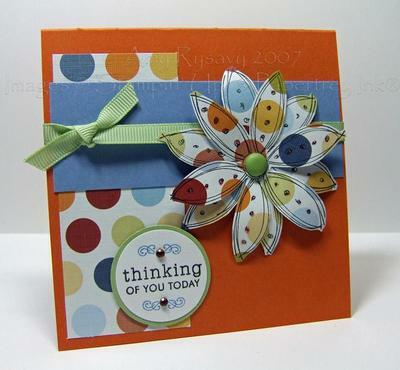 ), Prima Flower, Brad, Marvy Giga Scalloped Square Punch. Same brand of patterned paper for this one - I really like the polka-dots on it LOL! AND it's the same color combo as the floral so I just kept using the same supplies. The sentiment is from a Michael's $1 stamp - it has a birthday present as well but I only inked up the words. The ribbon is by May Arts - I thought I had used up all this green kind and then I found a *little* bit left in my ribbon jar! I'm *thisclose* to being out tho so I have to order more - I LOVE May Arts ribbon!! STAMPS: Emmybella by Stamping Bella, sentiment from Michaels. CS: Whisper White, Certainly Celery, Pretty in Pink, Rob & Bob Patterned Paper. INK: Black, Pretty in Pink, Certainly Celery, Close to Cocoa, Blush Blossom, Lavender Lace. ACCESSORIES: Prima Flower, Ribbon, Jumbo sei Brad, SU! Ticket Corner Punch. Isn't this tinkerbella image the cutest?? The person who sent me the stamped images stamped a few on an angle like this - SO cute! For this one I again used a Blender Pen and ink to color in the bella. I then added a bit of glue with my new Quickie Glue Pen, and poured on some Dazzling Diamonds (SU!) glitter. I attached the sentiment with a purple Bazzil Brad, and notched the corners w/ SU! 's Ticket Corner Punch. The ribbon I got from Michaels. STAMPS: Tinkerbella from Stamping Bella, sentiment from Faux Ribbon set by Papertrey. CS: Whisper White, Barely Banana, Pretty in Pink, Almost Amethyst, Lavender Lace, Rob & Bob Patterned Paper. INK: Black, Barely Banana, Pretty in Pink, Lavender Lace, Blush Blossom. ACCESSORIES: SU! 1 1/4 and 1 3/8" Circle Punches, Ticket Corner Punch, DD Glitter, Bazzil Brad, Ribbon. I *just* got this adorable Bella card in the mail as a RAK (random act of kindness) from Leslie G - THANK YOU Leslie! I LOVE the card ('specially the fact that you turned her shopping bag into a Chanel shopping bag LOL!!) it's so cute and springy!! And the note inside was very sweet too - I loved it. For anyone wondering the image is from Stamping Bella (one of my favorite stamp companies - I just love their retro style!!). What is your favorite method of coloring images? What do you do with all those stunning, gorgeous, beautiful cards you make and share with us on your blog? First off - thank you for the compliment!! (and no I didn't edit it LOL). I think I answered one like this before but my memory escapes me at the moment. SOME of the cards I make end up being sent away for Design Team requirements. SOME are for personal use. And yet others I send to a local shop here in town to sell (I think I've made a whopping $100 in the 6 months or so since I started selling them there - nothing much but it does get me a few goodies here and there LOL!). I also put a few in my display board (only ones made w/ SU! stuff for me to show at club and workshops etc). And some have no purpose at all but to be posted on here and then I put them in my stash to be hopefully sent out in the near future!! I would like to know how you come up with your color combinations. I'm always looking for new color combos instead of the tried and true. I just come up with them on the fly. A lot of the time I just start with one color and then grab random colors here and there to add to it - and more often than not I can make it work!! SU! 's Color Wheel was great for me at the beginning as I used to have a lot of trouble combining different colors - but I can say now that I haven't pulled it out in months!! I also write down different color combos as I come across them (last time I was at the mall with a friend I came up with SO many combos after seeing all the new Spring clothing lines!) and refer to them later when I'm creating. Given where you are, do you pretty much have to order everything online? A big YES to this one!! I only have one (*cough* overpriced!) Michaels and one scrapbook store in my area (and they are both in the city over an hour away!) so I order almost EVERYTHING online and 90% of it from the States. I have a list of online retailers on the right of my blog that has all the places listed that I've ordered from on a continuous basis. All of them I HIGHLY recommend - I get fabulous service from them all!! How do you take such lovely pictures of yours cards and retain the colors and the depth? Do you sell your cards, if you do, how do you market them? Yup I do. They are just in a box at a local hair salon that also doubles as a gift shop (and for anyone wondering NO I don't use any SU images on them - I have been asked that before!!). I don't make much money from it (like I said I've made maybe $100 or so in the past 6 months??) as I can't sell them for much - living in a small farming community it's nearly impossible to sell cards for what they are worth. People don't understand the time and effort that goes into making them (I think most of you can relate to that!!). The gals that work there tho really like them and promote them for me so I keep doing it!! I'm also trying to build up a stash to have on hand here as every once in a while people have contacted me wanting to buy cards so I'd like to have several on hand! We'll see how that goes tho! OK here's the last one got done yesterday!! I of course HAD to use this Tubby Time stamp - I think it's my favorite out of all the Bugz! I stamped the image in Versafine Black, colored it in with SU! markers, masked it, then stamped the large solid shadow stamp. I used clear glue on the "bubbles" and poured Dazzling Diamonds glitter onto it. The sentiment was made using Karen Foster Snap Stamps (the 1/8" casual size - they are TINY! I got them at my local scrapbook store months ago as well as the 1/4" casual) and then I doodled a border around it all with a black marker. This bitty Prima flower (from this set) was attached with a dot of glue, then I used a K&Co Rhinestone for the flower center. This ribbon looks a little washed out in the picture - but in real life it's gorgeous!! I got a bunch of different colors from AllThatScraps here in my last order and they are MUCH MUCH nicer in real life!! 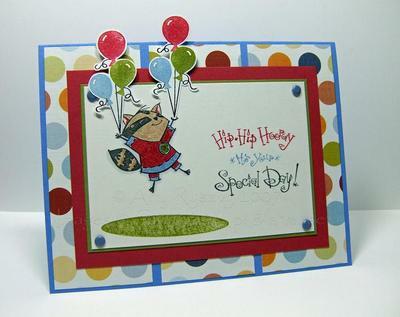 The patterned paper is from Chatterbox and was the color inspiration for this card. 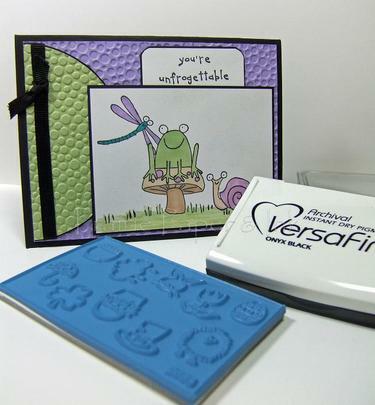 The card base was stamped with the Bubbles stamp in VersaMark then embossed with Clear Embossing Powder. 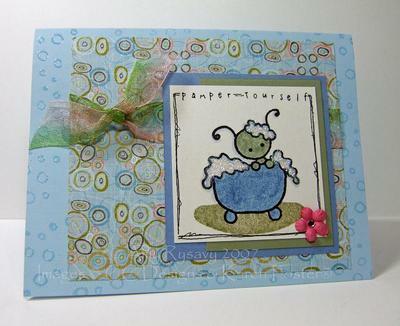 STAMPS: Tubby Time, Large Solid Shadow Stamp, and Bubbles all by CC Designs, Karen Foster Snap Stamps. CS: Bristol White, Mellow Moss, Brocade Blue, Bashful Blue, Patterned Paper by Chatterbox. INK: Versafine Onyx, Mellow Moss, Brocade Blue, Bashful Blue, Black Zig Marker. ACCESSORIES: Prima Flower, K&Co Rhinestone, Clear Glue, DD Glitter, May Arts Ribbon, Clear Embossing Powder. 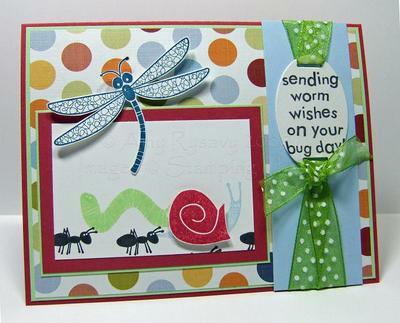 I finally got a chance yesterday to make some samples with the CC Designs Bitzy Bugz. Aren't they the cutest little things?? I love them! 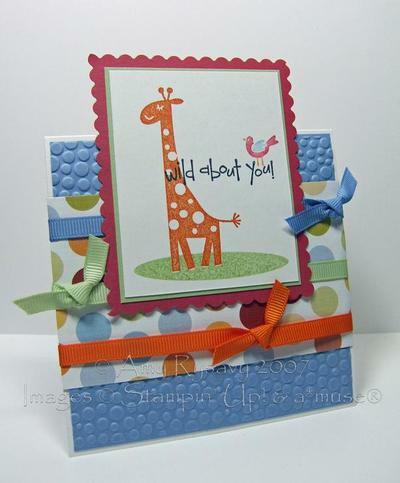 For this card I used all Stampin' Up! inks and card stocks, I stamped this Play Ball stamp in Versafine black ink and the large solid shadow spot in Creamy Caramel. I used SU markers to color him in. I didn't have any sentiments that I thought would "fit" so I made my own using these Karen Foster snap stamps (I think this is the 1/4" casual alpha?? I got it at my local scrapbook store MONTHS ago!!). I made this little baseball "charm" by punching out a circle of white CS (you can see Lauren's easy instructions on how to do this here - that's what made me think of doing this! ), marking the lines, then sponging the edges. I then covered it in VersaMark and embossed it with clear embossing powder, punched a hole in it and attached it with a piece of string. I punched holes in the main image to thread the ribbon through so that it wasn't going over the bug. 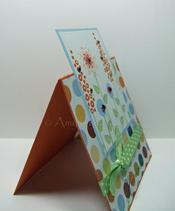 The green CS was put through my CuttleBug using the new Spots and Dots A2 embossing folder. 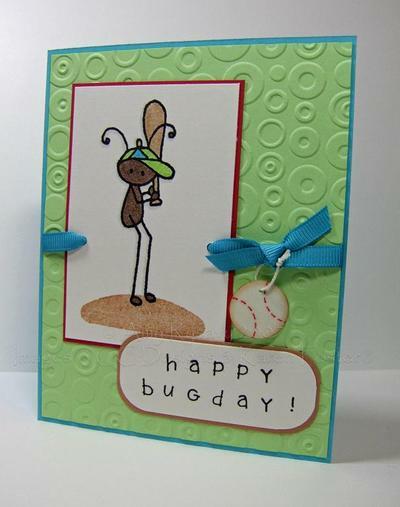 STAMPS: Play Ball Bitzy Bug and large shadow spot stamps by CC Designs, Snap Stamps by Karen Foster. CS: Bristol White, Ruby Red, Gable Green and Tempting Turquoise (all SU!). INK: Versafine Onyx, Creamy Caramel, Close to Cocoa, Gable Green, Tempting Turquoise, Ruby Red. 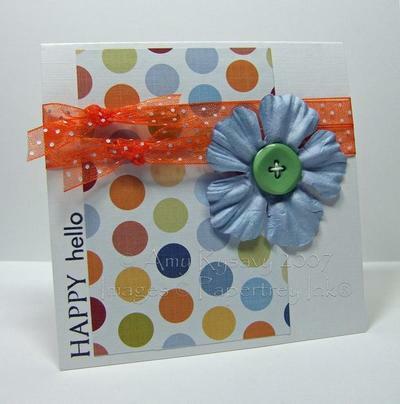 ACCESSORIES: Grosgrain Ribbon, Corner Rounder Punch, CuttleBug Dots & Spots A2 embossing folder, Clear Embossing Powder. What kind of modge podge do you use-matte, shiny, sparkly? And do you always do a coat after you apply the paper. Being on several design teams, do you ever have times when you just get stuck and can't come up with a design? And then what do you do to get your Mojo going again? When it comes to my design team stuff - I don't get stuck for ideas too often actually. Since I get the privilege of using brand new stamps before the public I'm starting with a "clean slate" as it were - so I usually don't have too much difficulty coming up with ideas. In fact at times I have more trouble choosing WHICH ideas to use!! However I DO lose my mojo at times - and can go through slumps where I just can't come up with anything. It happens to all of us - for me tho to get back in it I usually need to just get out of my studio and go do something else. I find if I take a break (even if it's only for half a day) and go do other things (read a book, surf the net, get a new magazine etc etc etc) it doesn't take long for the ideas to get rolling again. If you could only use paper from 1 company what company would it be? I am curious as to what your process is for a card design. Do you pick your layout first? Do you pick your stamps first? Do you pick your colors first? What is your favorite SU! stamp set and why? I answered this one here. As to the WHY - prolly b/c it's such a gorgeous set and I don't have anything else like it!! I have recently bought a cuttlebug and one cutting folder. My question is, does the top layer of plastic seem to warp after using, and is there a way to avoid all the cut marks on the plastic?!? No you can't - the B plate will warp and end up covered in cut marks after using it for a while. Mine is getting so marked up it's hard to see through! I've flipped it over so that the other side can get all cut up, and then I'm gonna switch them (put the cut up B plate on the bottom and the still clear one on the top) till they're both all warped and cut up - then I'll just buy a new set (you can get replacements B plates in sets of 2 - Michaels carries them as well as most other online stores that carry the CuttleBug). 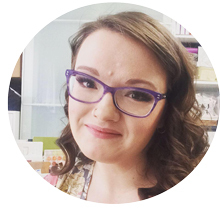 Do you make multiples of cards/projects or are you a once and done kind of gal? Definitely once and done. I make SO many cards and whatnot that I don't have time to make doubles/triples etc etc! The closest I'll come is doing similar cards (like the ones I did here) but changing the colors and whatnot. How do you like to use these fun little slider tags? As in the little ones that come with the Tiny Tags die?? I usually try to find a sentiment small enough to fit on them (now that Nichole has been designing all these fab sets like Paper Tray and Faux Ribbon I'm finding it a LOT easier to find words/sentiments that will fit!) and then attach them to the card with ribbon. My order from Ellen Hutson's store arrived the other day and I couldn't resist taking a picture of the goodies!! I also got this RAK (random act of kindness) in the mail yesterday from Erin!!! She sent me a Black Versafine ink pad, a little TAC set (and no I didn't have it and it's so cute! ), and this adorable card. Thank you SO much Erin!! I already started playing with the ink pad - so far so good - it is SO SO black - I really like that aspect of it. It does say it dries instantly - but the couple of times I stamped it it DIDN'T dry very quickly - so I used my heat tool and that did the trick. OK here's the last card I made using this Chatterbox Patterned Paper (for those that asked where they could find it - eclecticPaperie carries it here). 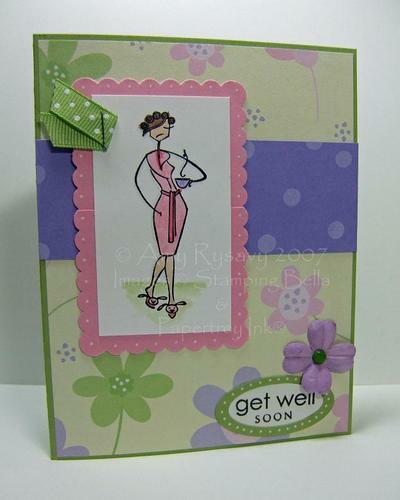 I used GinaK's Sweet Pea stamp (isn't it so cute? I just love the little grinning pea LOL!! ), on white CS and colored it in with SU! markers. This stamp *just* fits inside the 1 3/8" circle punch, so I punched it out, and used a punch out from the Key Tag punch behind for interest. 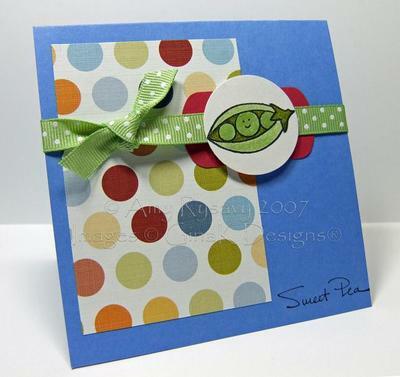 STAMPS: Sweet Pea and sentiment by GinaK Designs. CS: White, Ruby Red, Ballet Blue, Chatterbox Patterned Paper. INK: Palette Hybrid Noir, Certainly Celery, Old Olive. ACCESSORIES: SU! 1 3/8" Circle and Key Tag Punches, Ribbon (Michaels), Dimensionals. Oh and just an FYI - I am a little behind on my e-mails - don't worry tho I will get to them tomorrow. I have a SU club tonight and need to get everything ready for that!! Like I said I made *several* cards over the past couple of days! After making that Stamping Bella card I decided to keep the theme going and kept using this Chatterbox paper. This card is actually 4.25x4.25" but this top panel makes it measure 4.25x5.5 (so it will still fit in the A2 envelopes). Michelle Wooderson came up with this fun layout and I LOVE it - I will be making a lot more of these!! I used Papertrey's Green Thumb set and Stampin' Up! Classic inks (they really DO work well with clear stamps - I can almost always get nice, solid, crisp images), and added some bling with a few K&Co self-adhesive rhinestones (I picked up a pack at Michael's last time I was there - and now I wish I had bought more!!). The sentiment is from the Butterfly Kisses set, and the ribbon is from Michaels. This was a quick card - taking maybe 15 minutes?? I had the layout idea in my head, the colors were a snap as I was using the same patterned paper and color scheme, so it was just a matter of stamping it and putting it all together! STAMPS: Green Thumb and Butterfly Kisses by Papertrey Ink. CS: Whisper White, Bashful Blue, Pumpkin Pie, Patterned Paper by Chatterbox. INK: Pumpkin Pie, Apricot Appeal, Ruby Red, Bashful Blue, Certainly Celery, Palette Hybrid Noir. ACCESSORIES: K&Co Rhinestones, Ribbon. This is another 4.25x4.25" card. I stamped the large flower from the Doodle This set (in Stampin' Up! 's Spring Mini) onto the patterned paper twice then cut them out. I attached them to the card with this jumbo sei celery brad. I don't think you can tell from the picture - but I added dots of Fruit Punch stickles (from StarLitStudio) to the top flower's dots for a little glimmer. The sentiment is from Papertrey's Faux Ribbon set (have I told y'all how much I LOVE the fact that all the sentiments fit inside most of the SU! punches??? Well I do!! ), and I added a couple of rhinestones to the little flourishes. STAMPS: Doodle This (Stampin' Up! ), Faux Ribbon (Papertrey). CS: Whisper White, Brocade Blue, Certainly Celery, Patterned Paper by Chatterbox. INK: Palette Hybrid Noir, Brocade Blue. ACCESSORIES: Fruit Punch Stickles, sei Jumbo Brad, Celery Grosgrain, K&Co Rhinestones, SU! 1 1/4" and a 3/8" Circle Punches. I followed roughly the same layout for this card as I did for the one above - just putting the sentiment in a different spot. I used a button from my stash for the center of the Prima Flower - I sewed it to the flower with a bit of string and attached it to the card with a couple of mini glue dots. The ribbon I got from Jacksonbelle, and the sentiment is from the Papertrey Paper Tray set. I think I did this card in under 10 minutes - SO quick and easy!! It measures 4.25x4.25". STAMPS: Paper Tray by Papertrey Ink. CS: White, Patterned Paper by Chatterbox. INK: Palette Hybrid Noir. ACCESSORIES: Prima Flower, Button, String, Ribbon.